Several weeks earlier, Nielson had posted his company’s business plan on one of the many websites that purport to connect entrepreneurs with angel investors and venture capitalists. Nielson, 37, knew the drill. He had worked with investors and investment bankers before — he had even invested in other people’s businesses — so he was not going to get too excited about anything before he checked it out. Based on the website posting, Nielson received three legitimate offers to purchase the business outright, which he declined. Those kinds of inquiries were genuine and easy to authenticate. Equally easy to spot, he says, were the many inquiries that were not from genuine investors: “That was by far the vast majority.” The obvious frauds usually promised a large, immediate investment based solely on the business plan: Just send a transaction fee, and they’d send the money, no questions asked. Many of those were from outside the U.S.
“Then we got a call from a group in DC,” says Nielson. “I returned [the] message, but then [didn’t] hear from him for another month.” When the two finally spoke, the man said he’d been on an extended business trip abroad, and that he remained interested in learning more about the business. The man said he managed a large venture fund and wanted to discuss an investment of more than $1 million. Although it was lengthy and looked official, the contract included a request for an upfront “earnest money deposit” of $10,000. Warning bells went off in Nielson’s head, but, he says, even this request was made to seem justifiable. “Along with the contract, they sent an entire page explaining why they do the earnest deposit.” The explanation seemed particularly reasonable since, over the years, Nielson had encountered many investment bankers, loan brokers and others who all required an upfront fee. Still, Nielson harbored doubts, so he intensified his research on the purported investor and his venture fund. Much to his surprise and relief, he had better luck with personal references. Three different calls to the group’s landlord seemed to confirm that it had offices and staff (although oddly, no one was ever available to speak on the phone when Nielson called). The investor also happily produced references of previous customers–all of which turned up nothing but glowing reviews of satisfying experiences. Nielson finally asked for a face-to-face with the investor, conveniently scheduled during the man’s “business trip” to Atlanta, where they met at a restaurant. Nielson left Atlanta satisfied that the investor was for real. Finally, after nearly three months spent checking and double-checking, Nielson held his breath and made a $10,000 wire transfer to the investor’s bank account. That, of course, was the beginning of the end. The kind of business fraud that Nielson encountered is unusual only because it was so well-orchestrated, says Ken Lucas, media and public affairs specialist at the FBI. “Unfortunately, [Nielson] ran into a very smart, well-backstopped scammer.” Much more typical are the personal and business scams that try to score a quick buck off of unsuspecting entrepreneurs. Unfortunately, there is no sure way to know whether the person you are dealing with is legitimate. Lucas encourages entrepreneurs to be skeptical of any transaction with a new person or group. The best protection, he says, is to call references, check online fraud sites, inquire at the Better Business Bureau and trust your gut. Pay attention to the voice in your head that says, “Something just does not seem right.” “If you’re already thinking that this guy could be a fraud, slow the pace down,” Lucas advises. “A lot of times, your gut check is a pretty good reality check as well. Compounding a victim’s frustration, the FBI is often unable to investigate claims made by individuals or entrepreneurs because the agency’s limited jurisdiction and resources make it very difficult to investigate smaller crimes. Lucas says there is no hard and fast rule, but the agency is most concerned about larger frauds perpetrated by organized groups. For crimes netting less than $500,000 or so, a local or state agency will most likely be behind the investigation. But the FBI does offer some tools. Lucas recommends the Internet Crime Complaint Center which helps victims report fraud to the FBI and other appropriate agencies. 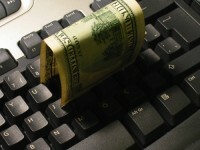 Also, LooksTooGoodToBeTrue.com provides a quick reference to the most common scams and how to avoid them. Nielson’s story is far from over, but he doubts he’ll ever see his $10,000 again. Even so, he has reported the crime to the FBI and other agencies. And he put the word out through various websites and blogs so others will not be duped by the same man. *This is a true story, but the victim’s name has been changed. David Worrell is the author of the e-book Finding Funding.